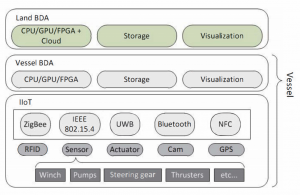 In this paper, we exploit an Unmanned Aerial Vehicle (UAV) as a data collector which first transfers wireless energy to an Internet of Things (IoT) node who then sends back the data packets to UAV. In particular, we present a resource allocation scheme for the data acquisition task by minimizing the overall energy consumption. We further investigate two optional allocations for wireless energy transfer time and data transmitting power as well as the applicable conditions. Numerical results show the adaptability of our allocation scheme with the varied value of channel-fading parameter and data size level. 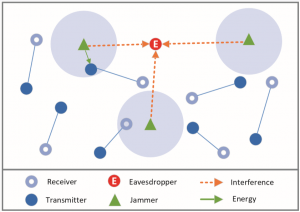 Friendly-jamming schemes can effectively reduce the eavesdropping risk in wireless networks by generating sufficient interference to prevent eavesdroppers from snooping confidential communications. However, this type of anti-eavesdropping schemes can also affect the normal communications due to the interference to legitimate users. On the other hand, Wireless Energy Transfer (WET) technology has received much attention recently since WET allows a node to obtain the energy from electromagnetic radiation. In this paper, we integrate the friendly-jamming scheme with WET. We call this scheme as Wireless-Jamming-Energy-Transfer (WJET). This scheme can translate the harmful interference radiated from jammers into the energy harvested by legitimate transmitters. In order to evaluate the effectiveness of this scheme, we establish an analytical model to analyze the transmission probability and the eavesdropping probability. Simulations verify that WJET scheme can simultaneously decrease the eavesdropping probability of eavesdroppers and increase the transmission probability of legitimate users. In addition, we investigate the density of jammers to achieve the optimal transmission probability according to various channel conditions, the density of transmitters and the transmission power of jammers. Recently, sentiment analysis on microblogs has received extensive attention recently. Most of previous studies focus on identifying sentiment orientation by encoding as many word properties as possible. However, most of them ignore the long-range dependencies of words (i.e., contextual features), which are essentially important in the sentiment analysis. In this paper, we propose a sentiment analysis method by incorporating Continuous Bag-of-Words (CBOW) model and Stacked Bidirectional long short-term memory (Stacked Bi-LSTM) model to enhance the performance of sentiment prediction. Firstly, a word embedding model, CBOW model, is employed to capture semantic features of words and transfer words into high dimensional word vectors. Secondly, we introduce Stacked Bi-LSTM model to conduct the feature extraction of sequential word vectors at a deep level. Finally, a binary softmax classifier utilizes semantic and contextual features to predict the sentiment orientation. Extensive experiments on real dataset collected from Weibo (i.e., one of the most popular Chinese microblogs) show that our proposed approach achieves better performance than other machine learning models. Open banking brings both the opportunities and challenges to banks all over the world. Due to the different economic development levels of each country and the gaps among financial environment maturity, all countries have different strategies and regulations towards the privacy protection of data in financial scenes, such as the General Data Protection Regulation (GDPR) by European Union (EU). A blockchain as a continuously growing list of records managed by a peer-to-peer network is widely used in various application scenarios, and can protect the privacy of financial data. However, financial blockchain still poses some problems that cannot fully meet the data protection needs. In order to address the existing problems, this paper proposes a new blockchain-based data privacy management framework. The framework consists of three components: a data privacy classification method according to the characteristics of financial data and a new collaborative-filtering-based model and a confirmation data disclosure scheme for customer strategies based on the Nudge Theory. We implement a prototype and propose a set of algorithms for this management framework. Fraudulent e-banking transactions have caused great economic loss every year. Thus, it is important for financial institutions to make the e-banking system more secure, and improve the fraud detection system. Researches for the fraud risk monitoring are mainly focused on score rules and data driven model. The score rule is based on expertise, which is vulnerable to new patterns of frauds. 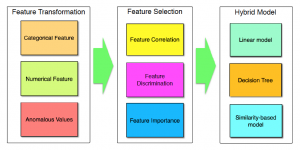 Data driven model is based on machine learning classifiers, and usually has to handle the unbalanced classification problem. 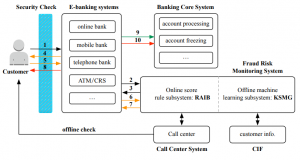 In this paper, we propose a novel fraud risk monitoring system for e-banking transactions. Model of score rules for online real-time transactions and offline historical transactions are combined together for the transaction fraud detection. Parallel big data framework: Kafka, Spark and MPP GBase which integrated with a machine learning algorithm is presented to handle offline massive transaction logs. Experimental results show the effectiveness of our proposed fraud risk monitoring system over a real massive dataset of e-banking transactions. This evaluation leads us to identify research gaps and challenges to consider in future research endeavours. There is an extensive attention on underwater cognitive acoustic networks (UCANs) since acoustic spectrum becomes deﬁcient owning to the proliferation of human activity in ocean. This paper presents an overview of our recent progress in investigating the connectivity of secondary users (SUs) in UCANs. In particular, this model takes both topological connectivity and spectrum availability into account. Simulation results verify the accuracy of the proposed model. Banks are shifting from a simple credit risk management model to the comprehensive risk management model. Banking risks come from many channels and systems. Big data technology provides an innovative and effective solution for data management, and thus is suitable to be applied in the risk management scenarios that require high-quality data and complex data analysis. 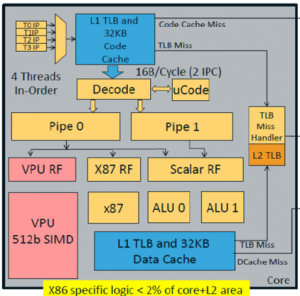 This paper firstly proposes big data architecture of hybrid processing engines and databases. This architecture uses Hadoop ecosystem with ETL and Spark processing engines, and using massive parallel processing databases (MPP), transactional databases, and HDFS. 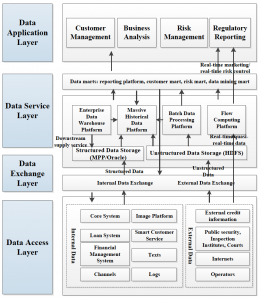 Then a banking comprehensive risk management system prototype based on the proposed big data architecture is implemented. Comparisons and evaluations clearly demonstrate that the proposed system has better performance. In Cognitive Radio Networks (CRNs), secondary users (unlicensed users) can use spectrum when their transmissions cause no interference to primary users (licensed users). The spectrum sensing is a necessity to achieve this spectrum sharing scheme. However, it is challenging to achieve spectrum sensing due to the computational complexity. In this paper, we propose a novel greedy algorithm to solve the wideband spectrum compressive sensing problem. The main idea of our algorithm is to reconstruct spectrum for wideband signals without any prior knowledge of spectrum. The proposed greedy algorithm will reconstruct wideband spectrum along with sub-bands of frequency in which spectrum is divided. The proposed greedy algorithm is intelligent enough to sense the range of each sub-band of frequency and detect them efficiently. Extensive simulation results show that our proposed algorithm outperforms existing greedy algorithms such as Orthogonal Matching Pursuit (OMP) in terms of accuracy, computational speed and Block OMP in terms of computational speed. Risk and Information System Control Framework in business includes the methods and processes to manage risks and seize opportunities that involves identifying particular risk events relevant to the objectives, assessing them in terms of likelihood and magnitude of impact, determining a response strategy, and monitoring progress. In order to achieve better support for the backtracking, traceability, irreversibility, and credible requirements of risk registration table data in the framework, this paper proposes a blockchain-based risk and information system control framework. A risk association tree is designed for combining summarized risk item ledgers with risk assessment ledgers and risk response ledgers based on the Merkle Tree. Three proposed smart contracts are used in risk identification, risk assessment, risk response and mitigation, and risk and control monitoring and reporting processes. We implement a prototype for this framework. This paper studies the throughput performance of a two-way energy harvesting relaying system. Network Coding and Energy Harvesting are promising techniques that can improve the transmission efficiency and the energy efficiency of wireless systems, respectively. In particular, we focus on the energy harvesting system with the power splitting-based relaying (PSR) protocol, and consider both the amplify-and-forward (AF) relaying and decode-and-forward (DF) relaying methods for the network coding. We successfully derive the expressions for both the outage probability and the system throughput for each case. It can be shown that DF relaying system outperforms AF relaying system in terms of both the outage probability and the throughput. Furthermore, simulations show that the throughput gain brought by network coding highly depends on the signal-to-noise ratio (SNR) at the receiver. The throughput gain can be up to 33% in the high SNR region. This paper investigates the impact of outcome- based education (OBE) on students’ learning achievement from a software engineering (SE) program. It is not easy to transform an SE curriculum from traditional knowledge-based education (KBE) method to OBE method since it requires us to identify the outcomes clearly and map the outcomes with the expected capabilities of students. We first give a briefing on our SE program and outline the curriculum, then investigate the impact of OBE in two selected courses in SE program, with the completion of one course being the prequisite for admission into the other one. Experimental results show that OBE can greatly improve the learning effectiveness of students and teaching quality. There is a substantial body of literature on analyzing Quality of Experience (QoE) of Video Streaming while there are few studies on standardizing QoE assessments. One of recent proposals on standardizing QoE of video streaming is video Mean Opinion Score (vMOS), which can model QoE of video streaming in 5 discrete grades. However, there are few studies on quantifying vMOS and investigating the relation between vMOS and other Quality of Service (QoS) parameters. In this paper, we address this concern by proposing a data-driven QoE analysis framework on video streaming QoE data. Moreover, we conduct extensive experiments on realistic dataset and verify the effectiveness of our proposed model. 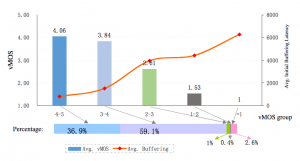 Our results show that vMOS is essentially affected by many QoS parameters such as initial buffering latency, stalling ratio and stalling times. 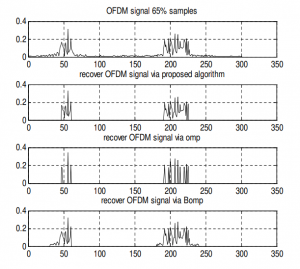 Interestingly, we have found that a small set of QoS parameters play an important role in determining vMOS. Blockchain, the foundation of Bitcoin, has received extensive attentions recently. Blockchain serves as an immutable ledger which allows transactions take place in a decentralized manner. Blockchain-based applications are springing up, covering numerous fields including financial services, reputation system and Internet of Things (IoT), and so on. However, there are still many challenges of blockchain technology such as scalability and security problems waiting to be overcome. This paper presents a comprehensive overview on blockchain technology. We provide an overview of blockchain architecture firstly and compare some typical consensus algorithms used in different blockchains. Furthermore, technical challenges and recent advances are briefly listed. We also lay out possible future trends for blockchain. To protect confidential communications from eavesdropping attacks in wireless networks, we propose a novel anti-eavesdropping scheme named AE-Shelter. In our proposed scheme, we place a number of friendly jammers at a circular boundary to protect legitimate communications. The jammers sending artificial noise can mitigate the eavesdropping capability of wiretapping the confidential information. We also establish a theoretical model to evaluate the performance of AE-Shelter. Our results show that our proposed AE-Shelter scheme can significantly reduce the eavesdropping risk without significantly degrading the network performance. As an emerging technology, Cooperative Device to Device (CD2D) communication has been considered to alleviate capacity shortage problem. In a heterogeneous CD2D network, multiple homing mobile devices (MMDs) may act as relays for the cooperative communication of ordinary mobile devices (OMDs). Under this setting, how to provide incentive mechanisms and motivate MMDs to lease spare bandwidths and allocate OMDs to MMDs should be carefully studied. Meanwhile, the competition dynamics between MMDs should also be taken into account. 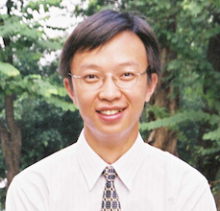 We formulate the joint bandwidth allocation and relay selection problem as a two-stage game. In the first stage of the game, a non-cooperative game is used to model the competition among the relay MMDs in terms of shared bandwidth and price. The second stage of the game models the behavior of OMDs selecting MMDs by an evolutionary game. We prove the Nash equilibrium of the game. Extensive numerical analysis and simulation results demonstrate effectiveness of the proposed scheme. 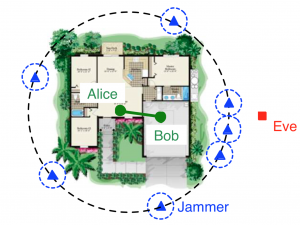 In this paper, we propose a novel anti-eavesdropping scheme by introducing friendly jammers to a wireless network of things (WNoT). In particular, we establish a theoretical framework to evaluate the eavesdropping risk of WNoT with friendly jammers and the eavesdropping risk of WNoT without jammers. Our theoretical model takes into account various channel conditions such as the path loss and Rayleigh fading as well as the placement schemes of jammers. Our extensive numerical results show that using jammers in WNoT can effectively reduce the eavesdropping risk. Besides, our results also show that the eavesdropping risk heavily depends on both the channel conditions and the placements of jammers. 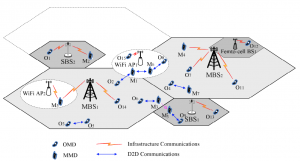 We investigate the percolation connectivity of wireless ad hoc networks with directional antennas (called DIR networks). One of major concerns is to derive bounds on the number of edge-disjoint directed paths (or highways). However, it is non-trivial to obtain bounds on the number of directed highways in DIR networks since the conventional undirected percolation theory cannot be directly used in DIR networks. In this paper, we exploit the directed percolation theory to derive bounds on the number of directed highways. In particular, we make new constructions in bond directed percolation model. We show that with high probability there are at least Ω(√n/log log √n) directed highways in a network with n nodes, which is much tighter than the existing results in DIR networks. 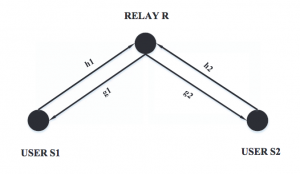 This paper concerns with the local connectivity (i.e., the probability of node isolation) of wireless networks with directional antennas. We propose an analytical framework to study the local connectivity with the consideration of directional antenna models and various channel conditions. With the framework, we construct a novel directional antenna model called Iris. We show that Iris can better approximate realistic directional antennas and can be easily used to analyze the local connectivity compared with existing directional antenna models. Extensive simulations show that the theoretical results are in good agreement with the simulation results verifying the accuracy and the effectiveness of our analytical framework. 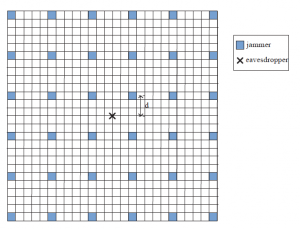 This paper investigates the eavesdropping attacks in underwater acoustic networks (UANets). In particular, we propose an analytical framework to model the eavesdropping attacks in UANets in terms of the eavesdropping probability. Results of extensive simulations match the analytical results, indicating the effectiveness and accuracy of our model. Besides, we also find that the eavesdropping probability in UANets heavily depends on the underwater acoustic channel characterizing by the acoustic signal frequency, the spreading factor and the distance between the transmitter and the eavesdropper. This study provides useful insights that will help us to design anti-eavesdropping schemes with a better protection on the confidential communications. Big Data Analytics (BDA) and Internet of Things (IoT) are rising quickly. The recent emerging Industrial IoT (IIoT), a sub-paradigm of IoT, focuses more in safety-critical industrial applications. Studies showed that the adoption of BDA increase companies’ output and productivity; IoT enables companies to have more information and control in physical resources, processes, and environments; BDA and IIoT complement each other and develop as a double “helix”. In this position paper, we briefly review the opportunities and challenges in this era of big data and IoT for the Møre maritime cluster; then we propose a new framework integrating BDA and IIoT technologies for offshore support vessels (OSVs) based on a hybrid CPU/GPU/FPGA1 high performance computing platform. We believe that such a framework, when implemented, can help maritime companies increase their output and productivity, and hence enable the whole cluster to continue to be a leader in the global maritime industry. In this paper, we propose a novel multi-channel wireless network with infrastructure support, called an MC-IS network. To the best of our knowledge, we are the first to study the capacity and the delay of such an MC-IS network. In particular, we derive the upper bounds and the lower bounds on the network capacity of such MC-IS networks contributed by ad hoc communications, where the orders of the upper bounds are the same as the orders of the lower bounds, implying that the bounds are tight. We also found that the capacity of MC-IS networks contributed by ad hoc communications is mainly limited by connectivity requirement, interference requirement, destination-bottleneck requirement and interface-bottleneck requirement. In addition, we also derive the average delay of MC-IS networks contributed by ad hoc communications, which is bounded by the maximum number of hops. The network connectivity is one of important measures of the performance of wireless networks. However, most of current studies on the network connectivity only consider either an SOMN network, where each node is mounted with a single omni-directional antenna, or an SDA network, where each node is mounted with a single directional antenna. Using multiple directional antennas instead of a single directional antenna can potentially improve the network performance. In this paper, we investigate the connectivity of a novel network, in terms of an MDA network, where each node is mounted with multiple directional antennas. We found that MDA networks have much stronger network connectivity than other existing networks (such as SOMN and SDA networks), and its connectivity degree heavily depends on the number of antennas, the beamwidth of each antenna and the path loss factor. The enhancement mainly owes to the usage of multiple antennas and the longer transmission range of directional antennas. This paper investigates the problem of link scheduling to meet traffic demands with minimum airtime in a multi-transmit-receive (MTR) wireless network. MTR networks are a new class of networks, in which each node can simultaneously transmit to a number of other nodes, or simultaneously receive from a number of other nodes. The MTR capability can be enabled by the use of multiple directional antennas or multiple channels. Potentially, MTR can boost the network capacity significantly. However, link scheduling that makes full use of the MTR capability must be in place before this can happen. We show that optimal link scheduling can be formulated as a linear program (LP). However, the problem is NP-hard because we need to find all the maximal independent sets in a graph first. We propose two computationally efficient algorithms, called Heavy-Weight-First (HWF) and Max-Degree-First (MDF) to solve this problem. Simulation results show that both HWF and MDF can achieve superior performance in terms of runtime and optimality. There are a number of studies on using directional antennas in wireless networks. Many of them concentrate on analyzing the theoretical capacity improvement by using directional antennas. Other studies focus on designing proper Medium Access Control (MAC) protocols to improve the practical network throughput. There are few works on the security improvement using directional antennas. In this paper, we explore the benefits of directional antennas in security improvements on both single-hop and multi-hop wireless networks. In particular, we found that using directional antennas in wireless networks can significantly reduce the eavesdropping probabilities of both single-hop transmissions as well as multi-hop transmissions and consequently improve the network security. Most of studies only consider that wireless sensor networks are equipped with only omni-directional antennas, which can cause high collisions. It is shown that the per node throughput in such networks is decreased with the increased number of nodes. Thus, the transmission with multiple short-range hops is preferred to reduce the interference. However, other studies show that the transmission delay increases with the increased number of hops. 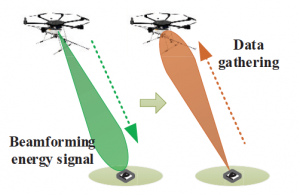 In this paper, we consider using directional antennas in wireless sensor networks. We have found that using directional antennas not only can increase the throughput capacity but also can decrease the delay by reducing the number of hops. We also construct a time-division multi-access (TDMA) scheme to achieve this. Compared with omni-directional antennas, directional antennas can reduce the interference and lead to the improvement on the network capacity. Furthermore, directional antennas can extend the transmission range, which leads to fewer hops and the lower multi-hop routing delay. The capacity of wireless ad hoc networks is affected by two key factors: the interference among concurrent transmissions and the number of simultaneous transmissions on a single interface. Recent studies found that using multiple channels can separate concurrent transmissions and greatly improve network throughput. However, those studies only consider that wireless nodes are equipped with only omnidirectional antennas, which cause high collisions. On the other hand, some researchers found that directional antennas bring more benefits such as reduced interference and increased spatial reuse compared with omnidirectional antennas. But, they only focused on a single-channel network which only allows finite concurrent transmissions. Thus, combining the two technologies of multiple channels and directional antennas together potentially brings more benefits. In this paper, we propose a multi-channel network architecture (called MC-MDA) that equips each wireless node with multiple directional antennas. We derive the capacity bounds of MC-MDA networks under arbitrary and random placements. We will show that deploying directional antennas to multi-channel networks can greatly improve the network capacity due to increased network connectivity and reduced interference. We have also found that even a multi-channel network with a single directional antenna only at each node can give a significant improvement on the throughput capacity. Besides, using multiple channels mitigates interference caused by directional antennas. MC-MDA networks integrate benefits from multi-channel and directional antennas and thus have significant performance improvement. The application of directional antennas in wireless ad hoc networks brings numerous benefits, such as increased spatial reuse and mitigated interferences. Most MAC protocols with directional antennas are based on the RTS/CTS mechanism which works well in wireless ad hoc networks using omnidirectional antennas. However, RTS/CTS frames cannot mitigate the interference completely. Besides, they also contribute a lot to the performance overhead. This paper studies the problem from a new perspective. We have found that the transmission success probability under directional transmission and directional reception is quite high when the antenna beamwidth is quite narrow. Motivated by the analytical results, we design a lightweight MAC protocol without RTS/CTS frames. The preliminary results demonstrate that this new protocol performs better than MAC protocols based on the RTS/CTS mechanism. The results also show that a collision-tolerant transmission is feasible under the narrow beam configuration. Applying directional antennas in wireless ad hoc networks offers numerous benefits, such as extended communication range, increased spatial reuse, improved capacity and suppressed interference. However, directional antennas can cause new location-dependent carrier sensing problems, such as new hidden terminal and deafness problems, which can cause severe penalties to the performance. Recently, a few schemes have been proposed to tackle these problems. However, these methods can provide limited solutions on the hidden terminal and deafness problems. We propose a new MAC protocol, termed the busy-tone based directional medium access control (BT-DMAC) protocol. When the transmission is in progress, the sender and the receiver will turn on their omnidirectional busy tones to protect the transmission. By combining with directional network allocation vector (DNAV), the scheme almost mitigates the hidden and the deafness problems completely. The mechanism increases the probability of successful data transmission and consequently improves the network throughput. This paper describes the BT- DMAC scheme and analyzes its performance. The simulation results also demonstrate the effectiveness of the protocol. Although directional antennas have been used in mobile communications systems for quite a long time, realistic applications of directional or smart antennas in wireless ad hoc network have emerged just in recent years. Directional antennas provide numerous benefits, such as higher gains, increased transmission range and low interferences. Wireless medium access schemes play a crucial role in ensuring the efficient and fair sharing of wireless resources. Therefore there are many research work on mechanisms at the wireless medium access layer by using directional antennas. The new features of MAC with directional antennas can cause not only location dependent carrier sensing problems, which have appeared in omnidirectional wireless networks, but also novel issues related to directional antennas. In this paper, an introduction of directional antennas is given. We give a classification of the current wireless MAC protocols using directional antennas. We also present different MAC protocols and compare them. This survey discusses the challenges in the design of these MAC protocols.